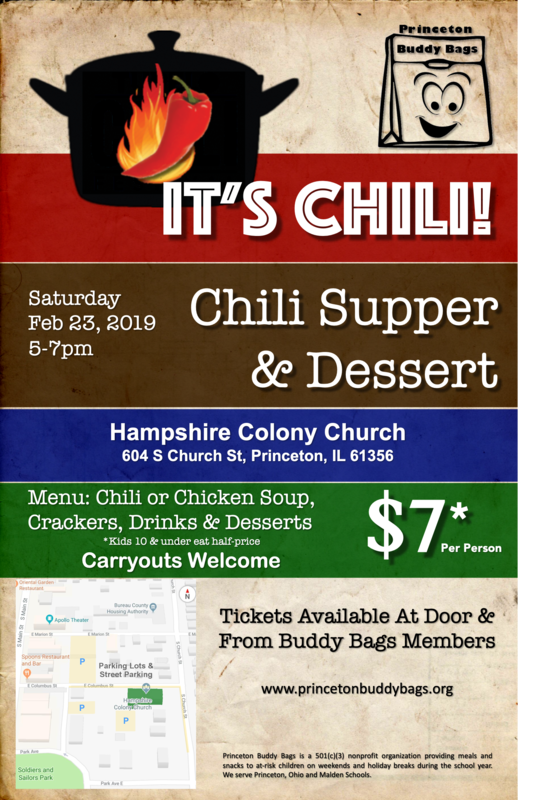 Please join us Feb 23 at Hampshire Colony Church to support Buddy Bags and share some delicious Chili with family and friends. $7 per person with kids 10 and under eating for $3.50. Welcome to Buddy Bags. We hope you find our information helpful and if you are near to Princeton IL, we encourage you to join us for a meeting. Board meetings are typically held on the second Thursday of every month. We are updating the calendar and announcement page for event dates and times. We also plan a variety of fundraisers and outreach opportunities, so be sure to check back and keep an eye out for our publicity in the community. If your organization would be interested in a presentation about Buddy Bags or if you have any questions, please contact us, or check out our updated brochure. If you are considering donating to Buddy Bags, you can contact any board member or donate online. Thank you! Please also consider using our Amazon Smile link which donates 0.5% of your purchases to Buddy Bags at NO COST TO YOU. Amazon donates this money and your shopping cart price won't change! Everyone at Princeton Buddy Bags would like to thank all of the businesses, organizations, volunteers, donors, and organizers for helping us reach our funding goals at our Draw-down in August. You continue to make such meaningful contributions to the wellbeing of area children and we are thankful for your support! The 2017-2018 school year has begun. Check our calendar and come join us for one of our weekly packs (typically under 30 minutes) ! In September 2017, Princeton Buddy Bags once again received a generous grant from DuPont Pioneer Account Manager Drew Schlumpf. 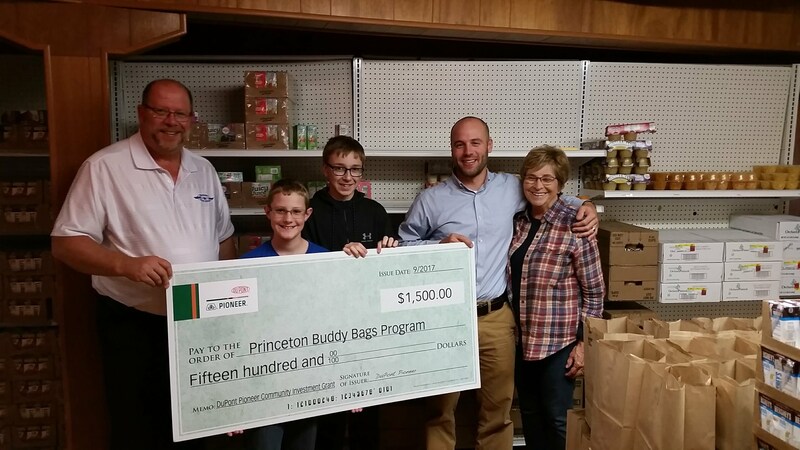 Pictured left to right: Princeton Buddy Bags, President - Mark Frank, Volunteer - Braydyn Kruse, Volunteer - Ethan Hassler, DuPont Pioneer Account Manager - Drew Schlumpf and Ohio Volunteer - Carol Von Holden. Thank you DuPont Pioneer! In September 2016, Mark Frank received a $250 donation from Amber Biddix of the Tiskilwa Community Association. Thank you to the TCA! Braydyn Kruse & Mark Frank recieve a $3000 grant from DuPont Pioneer Account Manager—Drew Schlumpf. Buddy Bags thanks the DuPont Pioneer team for their generosity!